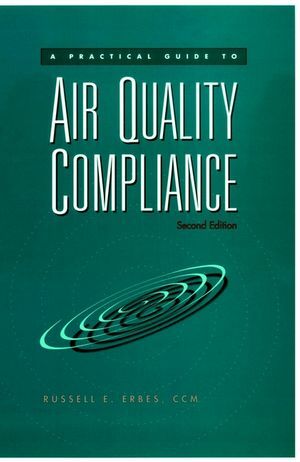 This easy-to-read guide links the regulatory and technical aspectsof air quality compliance in one self-contained volume. This unique handbook explains air quality compliance in plainlanguage, free of legalese. Russell E. Erbes draws on twenty yearsof industrial air quality compliance experience as he clarifies thecomplex regulatory and technical issues facing industry in the wakeof the 1990 Clean Air Act Amendments. He guides the reader througha labyrinth of demanding regulations, rising costs, and complexprocedures. * Unwritten applicability guidelines known only by technicalexperts in air compliance. * Tips on obtaining permits and variances, and monitoring andensuring compliance. * Appendices that explain terms, list air toxins and potentialhealth risks, and more. * Coverage of Title V programs, acid rain provisions, stratosphericozone protection, atmospheric dispersion modeling, and riskassessment methodologies. * A chapter on the new criminal and civil penalties fornoncompliance. * A survey of the major differences among federal, state, and localrequirements. For environmental managers and engineers at industrial facilities,environmental consultants and attorneys, and professionals inregulatory agencies, this practical guide removes the guessworkfrom the air quality compliance process. Russell E. Erbes, CCM, is Senior Vice President and Director of Air Quality Services for Kleinfelder, Inc., a major environmental and engineering consulting firm. History of Air Quality Legislation. Ambient Air Quality Standards and Atmospheric Dispersion. Emission Standards for Criteria Pollutants. Permits and the New National Operating Permits Program. Acid Rain Provisions of the 1990 CAA. Future Implementation of the 1990 CAA.